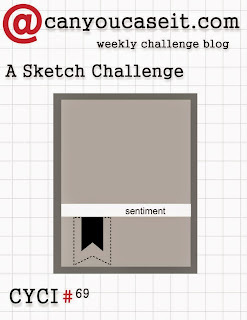 Today we have another sketch challenge over at CYCI. Here's my take on the sketch.. I started with a A2 cardbase of Coastal Cabana cardstock and I layered on a piece of Night of Navy cardstock. I topped that with 2 patterns of Maritime DSP with a thin piece of Night of Navy seperating the two DSP patterns. I stamped the Octopus from the Stampin' Up! "Sea Street" stamp set in Coastal Cabana and cut it out with a Dies by Dave coordinating die. I then using some reverse confetti banner/tag dies to cut out two DSP banners for the bottom of the card as well as a smaller one in Whisper White. I stamped the sentiment from the Vintage Stampin' Up! "Hello, Sailor" stamp set. 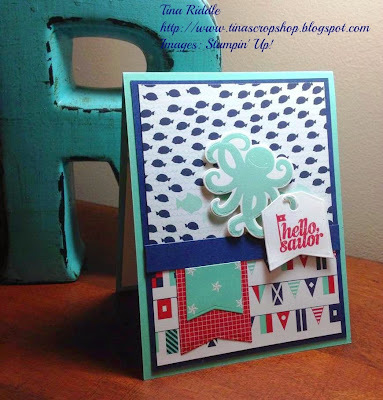 I hung the hello sailor tag from one of the arms of the Octopus and Attached it with Stampin' Dimensionals to my card. Thanks for stopping by. I hope you'll check out all of the other great inspiration the Design Team has for you this week and I hope you'll this this sketch challenge a try! Adorable card! You have taken the flag idea to a whole new level with all the other flags. Very cute!!! Love how you hung the tag on the octopus! Such a fun card!! You are the Sprinkles on the Cupcake of Life!